Two 250 m high guyed masts with a "top load" between the pole tips that results in a folded monopole. 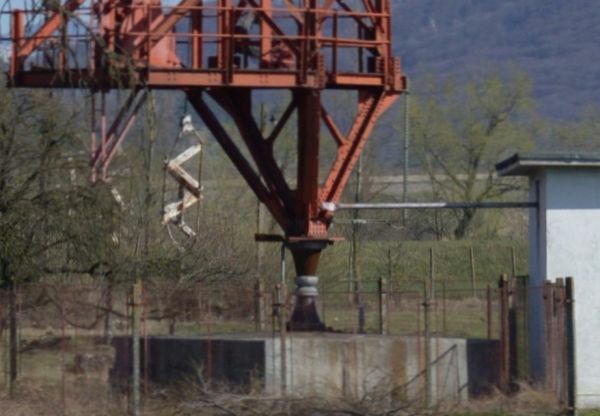 In the background, the MW antenna. In the photo above it is difficult to see the "top load" between the two masts . After editing the photo (see below) the top load can be seen quite good and you can even see that the top load consists of six individual wires. 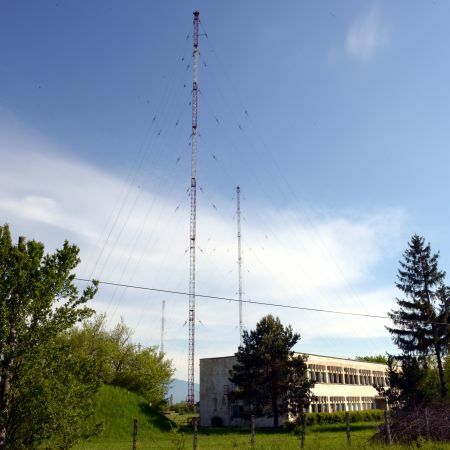 The history of the long-wave transmitter in Bod began in 1929. 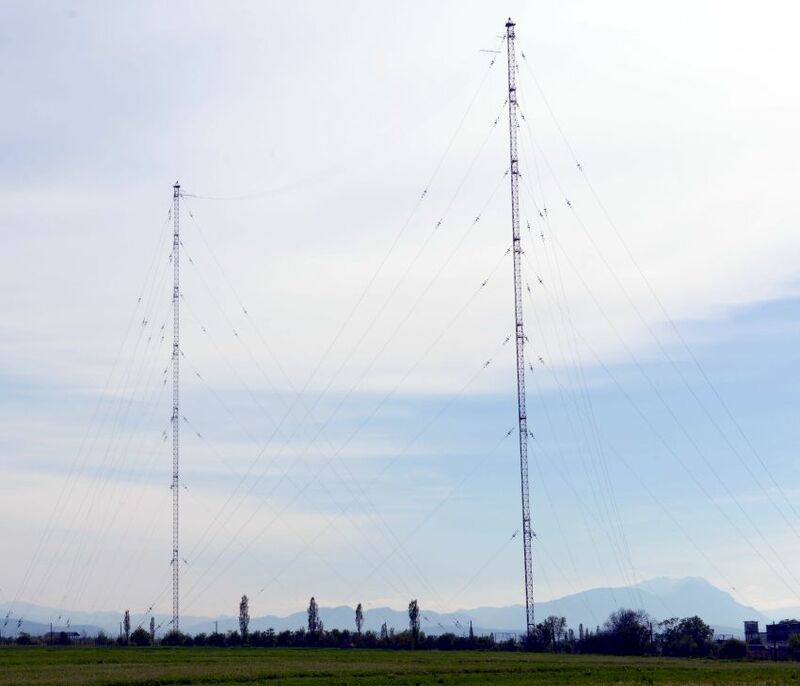 Using a German "Funktelegrafie" equipment, consisting of two 40 m high telescopic masts and a 750 watt transmitter, captured in the first world war, field measurements and experimental broadcasts on 156 kHz were started in order to explore a location for a LW. 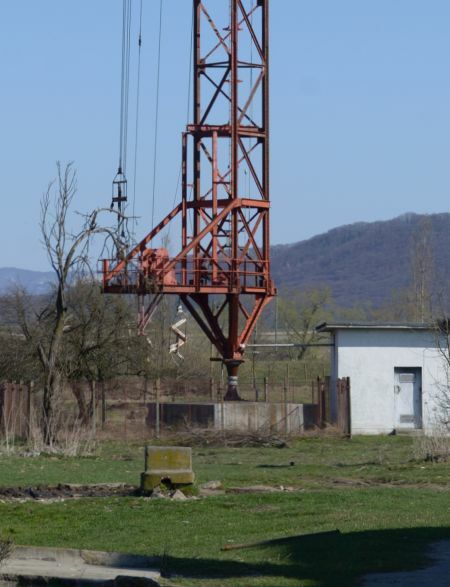 Finally, they started - near the village of Bod about 10 km north of Brasov - the construction of a provisional transmission system with 20 kW power. Part of the antenna was suspended between two masts of 40 m from pine wood. In Lucerne wave plan of 1934 Romania was awarded the long wave frequency 160 kHz. 1933 began the construction of a final system with 150 kW output power. The contract for the supply of broadcasting technology was awarded to the Guglielmo Marconi . 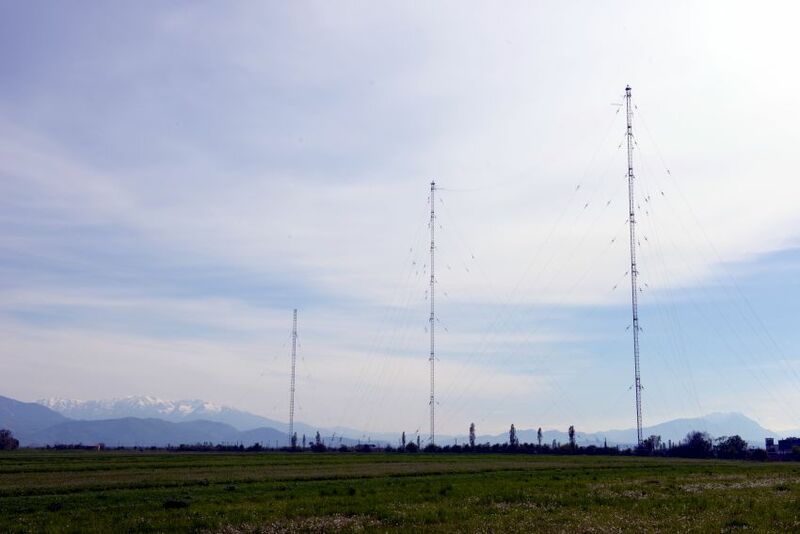 Although the high water level provided ideal conditions for a long-wave antenna, however, it caused significant problems in the construction of buildings. The station building had therefore to be placed on foundation 15 m long impregnated oak trunks. 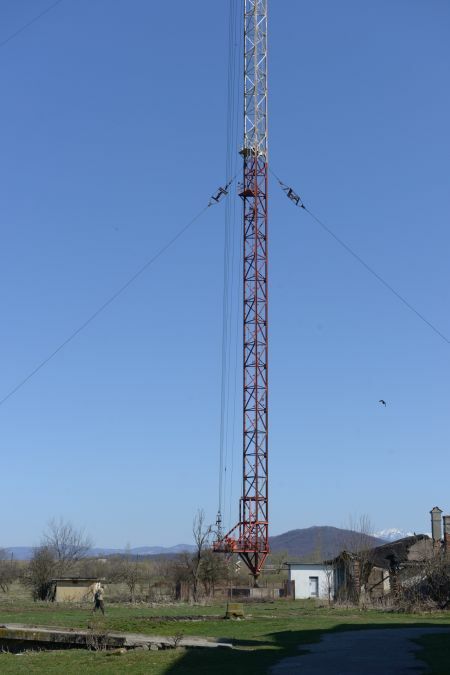 The two guyed masts of Romanian companies were 225 m high, each in 7 levels three times guyed. This kind of masts were a European premiere. The system was largely completed technically in January 1935 but it was set into operation only on 1st of January 1936 on 160 kHz; then it was one of the strongest stations in Europe. The power supply was performed by three per 700 hp diesel engines, because there was no adequate public power in this area. During the war the plant was largely unscathed. Only one mast was damaged in a bombing raid in 1946 and it was restored. After the agreements of the Copenhagen wave plan of 3/15/1950 the frequency was changed from 160 kHz to 155 kHz. In 1965, the station was reinforced to 1200 kW by a new transmitter by "Thomson-Houston" from France. 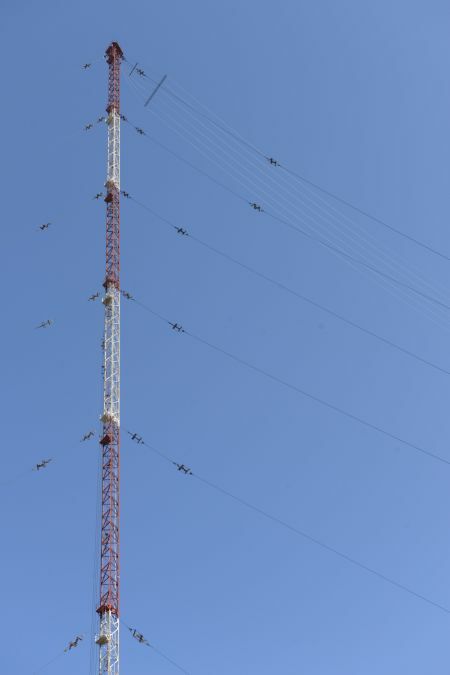 The transmitting antenna was rebuilt and since then it consists of two 250 m high guyed towers with a roof capacity between the pole tips representing a folded monopole. On 01/02/1986 due to the Geneva wave plan there was a small change in frequency to 153 kHz. 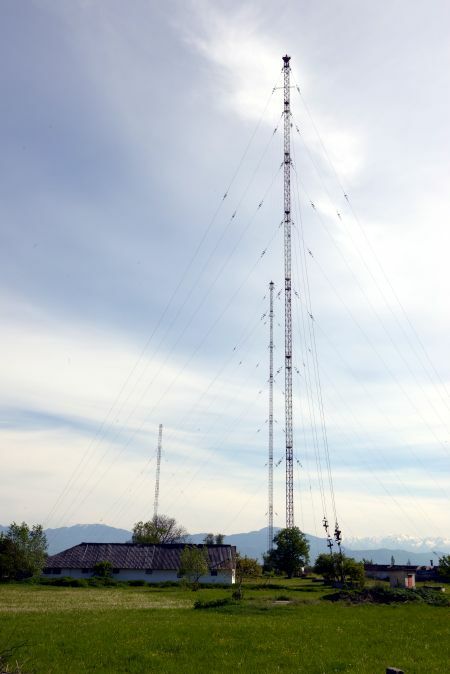 2003, the transmitter was replaced by a new one of "Harris", which is fully transistorized, but it only uses 200 kW. 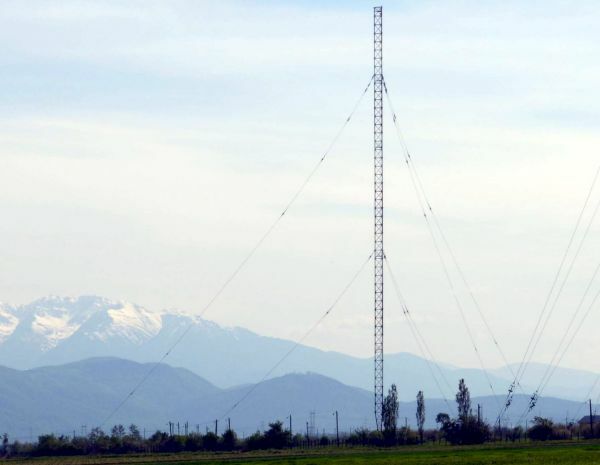 On the site there is also a medium wave transmitter, the antenna of which consists of a guyed steel framework mast, which stands directly beside the long-wave antenna. The frequency is 1197 kHz at a power of 14 kilowatts. You may increase, decrease, shift, change to satellite mode etc.